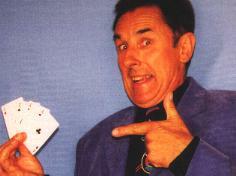 Mel Harvey is fast becoming one of the country's leading comedy entertainers. His theatre act is a cross between Max Miller and Joe Pasquale. 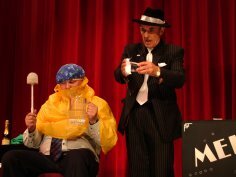 This act is the ideal comedy support act for star-name theatre tours and is available from twelve minutes to forty five minutes (the whole of the first half, as performed recently at The Belgrade Theatre, Coventry) Stars previously supported on stage and T.V. include Ken Dodd, Bert Weedon, Keith Harris, Lionel Blair, Jimmy Cricket and Don McLean. For some years Mel has been developing his comedy and magic in UK theatres and is now literally broadening his horizons with work all around the world. Mel has worked on two cruise liners for P&O: "The Arcadia" and "The Oriana" and has recently returned from Alaska with Silversea Cruises on the "Silver Shadow" and has been re-booked for the Silverwind. The act is perfect for cabaret situations and Mel is also available for after dinner speaking and as an act or compere/M.C. for theatre shows. "Wishee Washee, as played by Mel Harvey was the general favourite"
"Mel Harvey's Panto debut can be deemed a great success!"